It’s a beautiful thing when Southern Californians take pride in their fascinating and diverse history. This past weekend the Metro Transportation Library & Archive logged its 3,000,000th view on our online Flickr photo gallery (yes, three million in less than five years). Over here at The Source, the reaction to “then and now” photos has prompted the Library & Archive to share its own version of historical images compared to the street scene today. Our Library has selected and uploaded over 200 photos to Historypin, a social media site that maps images and mashes them up with a chronological data layer so you can view photos of a particular place AND time. With the local transportation conversation ramping up month by month, we know this is a great way to engage our community in the past AND present. 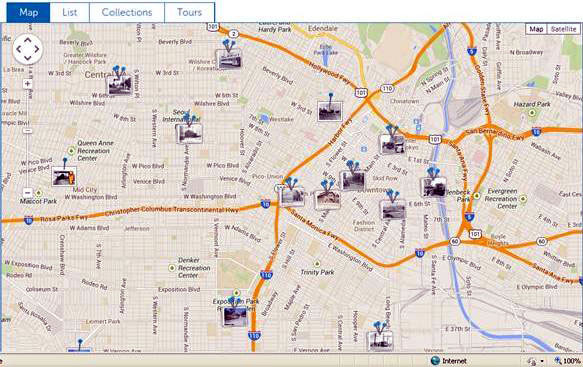 Most of our images on Historypin and concentrated in and near downtown Los Angeles. Fortunately for us, most of our photos are of streetcars and buses. 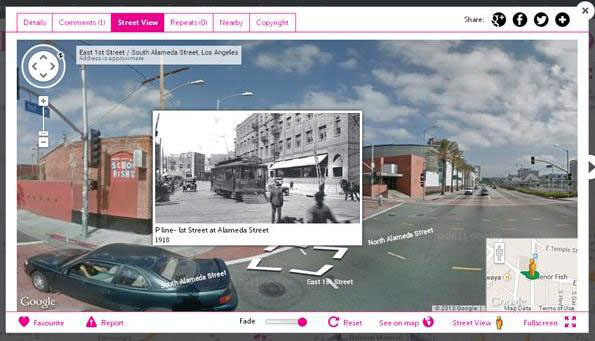 Good thing: Historypin has partnered with Google to leverage powerful mapping tools with “street view” imagery. 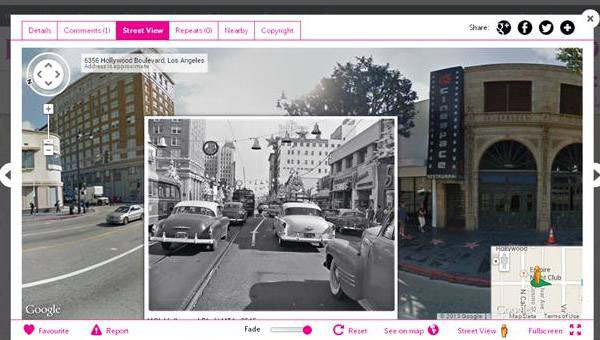 This serves us well in providing an “augmented reality” effect — superimposing views of yesteryear on the streets of today. We have taken pains to position many our images onto Street View so they match up as well as possible. But Historypin isn’t limited to just our collection. Metro is a leader in helping other local archives and libraries in our LA as Subject network to get their photos digitized and onto Historypin. Los Angeles Public Library’s collection is particularly interesting, as well as other transit agencies, including the wonderful history shared by San Francisco Muni. 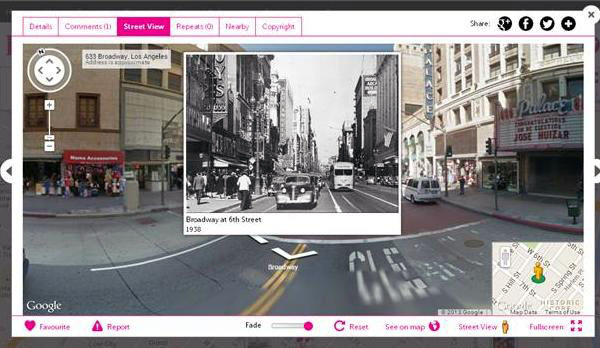 Even better, Historypin images feature a slider at the bottom of the photo allowing you to fade in and out the historical image compared to today’s street scene. When you find an image in our collection (or any other!) with the little yellow man indicating “Street View,” click “Street View” in the bottom right and then slide the “Fade” button below the centered historical image to see the effect. Get ready to spend hours getting lost in historic Los Angeles…or elsewhere in the world! Historypin is also available as a mobile app, so you can check out historical views of your location wherever you go! We were a global launch partner for Historypin when we began in July, 2011. But Historypin isn’t limited to just our collection. Metro is a leader in helping other local archives and libraries in our LA as Subject network to get their photos digitized and onto Historypin. Los Angeles Public Library’s collection is particularly interesting, as well as other transit agencies, including the wonderful history shared by San Francisco Muni.